Berlin, January 31, 2013. Native Instruments today launched a time-limited sales special, offering customers the chance to pick up KOMPLETE 8 and KOMPLETE 8 ULTIMATE at considerable savings for the next two months. Customers choosing the KOMPLETE 8 package, which features 27 KOMPLETE Instruments and Effects, will save $160 / 100 EUR on the standard price – down to $399 / 399 EUR from $559 / 499 EUR. 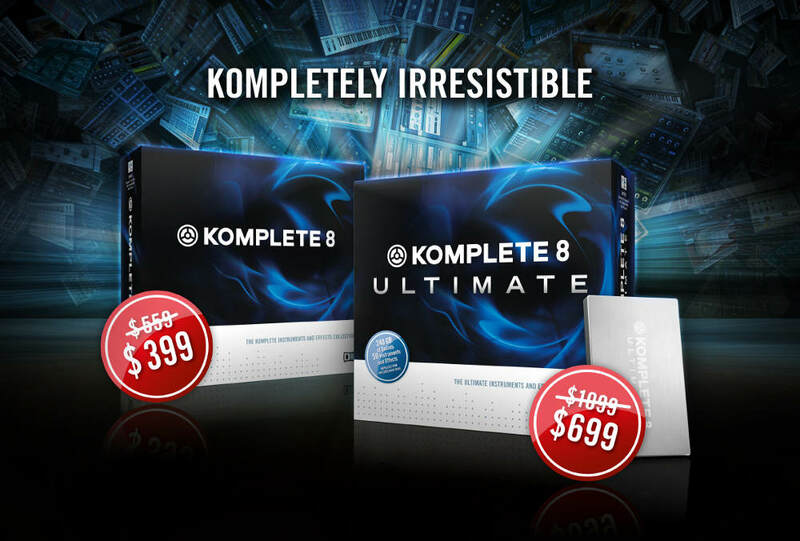 The KOMPLETE 8 ULTIMATE bundle, which comes with 50 Instruments and Effects, will be available for $699 / 699 EUR instead of $1099 / 999 EUR – a saving of $400 / 300 EUR. The KOMPLETELY IRRESISTIBLE sales special will run until midnight (CET) on March 26, 2013, with the deal available at participating retailers and the NI Online Shop – while stocks last. KOMPLETE 8 ULTIMATE contains 50 products and over 240 GB of sound – the entire range of KOMPLETE Instruments and Effects (at the time of release) on an external hard drive. In addition to the products in KOMPLETE 8, it also contains RAZOR, SESSION STRINGS PRO, SCARBEE FUNK GUITARIST, VINTAGE COMPRESSORS and many more. KOMPLETE 8 will be available for $399 / 399 EUR. KOMPLETE 8 ULTIMATE will be available for $699 / 699 EUR. Offer is valid at retailers and via the NI Online Shop until March 26, 2013, and while stocks last.